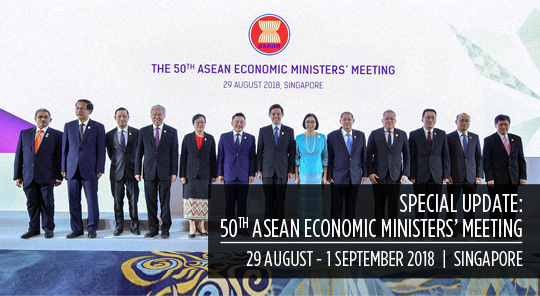 The 50th ASEAN Economic Ministers’ (AEM) meeting concluded in Singapore on 1 September 2018. The meeting was chaired by Singapore’s Minister for Trade and Industry, Chan Chun Sing. Prior to the 50th AEM meeting, a preparatory meeting of the ASEAN Senior Economic Officials (SEOM) was held. The economic ministers also convened joint meetings with the 32nd ASEAN Free Trade Area (AFTA) Council and the 21st ASEAN Investment Area (AIA) Council. ASEAN’s combined GDP reached US$2.8 trillion in 2017, a 5.3 per cent growth year-on-year, up from 4.8 per cent in 2016. Growth is expected to remain stable at 5.2 per cent in 2018 and 2019. ASEAN’s total merchandise trade reached US$2.55 trillion in 2017, an increase of 14.1 per cent year-on-year, of which 22.9 per cent was intra-ASEAN. Among the bloc’s dialogue partners, China, the European Union (EU) and the United States (US) ranked as the region’s top three trade partners in 2017. ASEAN’s total services trade stood at US$695.2 billion in the same year, of which 16.7 per cent was intra-ASEAN. Inflows of foreign direct investment (FDI) to ASEAN reached US$137 billion in 2017. At 19.4 per cent, intra-ASEAN contributed the highest share. The top three sources of external FDI inflow to the region are the EU, Japan and China. The services sector remained the largest recipient of FDI inflows to ASEAN, amounting to US$90.12 billion or 65.8 per cent total inflows in 2017. Operationalisation of the AEC 2025 Monitoring and Evaluation (M&E) Framework is in progress. Country visits to the Philippines and Indonesia were completed in 2017, and terms of reference (TOR) for the AEC 2025 M&E country visit was adopted as a technical verification tool for compliance monitoring. Development of the compliance monitoring and integration monitoring databases in the ASEAN Secretariat was completed to support compliance and outcomes monitoring, respectively, as well as the publication of the updated AEC 2025 Consolidated Strategic Action Plan and the third issue of the ASEAN Economic Integration Brief. The ASEAN Agreement on Electronic Commerce (E-Commerce) was endorsed by ASEAN Economic Ministers, and it will be signed at the sidelines of the 33rd ASEAN Summit at the end of 2018. ASEAN Economic Ministers adopted the ASEAN Digital Integration Framework and was submitted to the AEC Council. It will be endorsed at the end of 2018. First Protocol to Amend the ASEAN Trade in Goods Agreement (ATIGA) was signed to allow for the operationalisation of the ASEAN-wide Self-Certification (AWSC), and the Protocol to implement the 10th ASEAN Framework Agreement on Services (AFAS). ASEAN Trade in Services Agreement (ATISA) negotiations is in progress and it will be signed at the 17th AEC Council in November 2018. ASEAN Single Window (ASW) is being implemented among five ASEAN Nations – Indonesia, Malaysia, Singapore, Thailand and Vietnam. Progress is made by Brunei Darussalam, Cambodia and the Philippines, who are in the final stages of testing the exchange of the e-ATIGA Form D in joining the ASW. Memorandum of Understanding (MoU) with the International Renewable Energy Agency will be signed at the 36th ASEAN Ministers on Energy Meeting (AMEM) in October 2018. Under the ATIGA, 99.3 per cent of import duties have been eliminated for the ASEAN-6 while the corresponding figure for Cambodia, Laos, Myanmar and Vietnam is pegged at 97.7 per cent. ASEAN, on the whole, has eliminated 98.6 per cent of import duties. ATIGA Tariff Reduction Schedules (TRSs) in ASEAN Harmonised Tariff Nomenclature (ATHN) 2017 of Brunei Darussalam, Indonesia, Laos, Malaysia, Myanmar, the Philippines, Singapore and Thailand were endorsed by the AFTA Council. Transposed ATIGA Product Specific Rules (PSRs) (Annex 3) in Harmonised System (HS) 2017 is completed with the target implementation on 1 December 2018. The ASEAN Seamless Trade Facilitation Indicators (ASTFI) Baseline Study, which will enhance the monitoring of the implementation of trade facilitation measures in the region was completed. ASTFI and Time Release Studies, which will be completed by the end of 2018, will enable ASEAN to determine the potential contribution of ASEAN trade facilitation initiatives in achieving the target of 10 per cent reduction in trade transactions cost by 2020 and striving to double intra-ASEAN trade by 2025. The ad-referendum of the ASEAN Framework Agreement on the Facilitation of Goods in Transit (AFAFGIT)’s Protocol 2 (Designation of Frontier Posts) including the endorsement of the List of Designated Frontier Posts was signed by all ten ASEAN Director-General of Customs in May 2018. AHTN 2017 by all ASEAN Member States was implemented on 1 July 2018 and endorsed TOR of the Technical Sub-Working Group on Classification (TSWGC) to assume the role of the existing AHTN Task Force. The MRA on Inspection and Certification System on Food Hygiene for Prepared Foodstuff Products was completed and signed. ASEAN Guidelines on Type Approval Control on Weighing and Measuring Equipment was finalised. Protocol to Implement the Tenth Package of Commitments of the AFAS was signed by the ASEAN Economic Ministers. It is the final AFAS package as ASEAN transitions into the next phase of integration under the ATISA. Implementation of the ASEAN Qualifications Reference Framework (AQRF) is in progress. Agreement was reached to enhance the ASEAN Comprehensive Investment Agreement (ACIA), as the investment related deliverable of Singapore’s ASEAN chairmanship for 2018. Handbook for Competition Policy and Law for Business 2017 and the Competition Compliance Toolkit for Businesses in ASEAN was published. The ASEAN Regional Cooperation Framework on Competition (ARCFC) was endorsed by the ministers, which encouraged sharing of agency and case-related information as well as merger and enforcement cooperation in ASEAN. The work on consumer protection policy and law was reviewed by the ASEAN Economic Ministers, noting that efforts continue to put in place a common protection framework in ASEAN through the upgrading of rules and regulations in the ASEAN Member States. On-going work on compiling baseline data for tracking the outcomes of the IP delivery systems. Development of common examination manuals to further enhance service delivery and endorsed the ASEAN Common Guidelines on Industrial Designs, which will be published in September 2018. ASEAN IP Training Platform will be operationalised to help micro, small and medium enterprises (MSMEs) learn about IP asset protection and commercialisation. To date, 126 innovation technology support offices/ technology transfer offices established. Working Group on Digital Data Governance, under the purview of the ASEAN Telecommunications and Information Technology Senior Officials Meeting (TELSOM), has been established to develop an ASEAN Framework on Digital Data Governance. ASEAN SME Policy Index (ASPI) 2018 was endorsed as a reference tool to help monitor and evaluate ASEAN’s efforts in advancing MSME development policies in the region. Publication of the 2018 edition of the Future of ASEAN: 50 Success Stories of Digitalisation of ASEAN MSMEs, which is targeted for release in November 2018. Activities to the ASEAN Business Inclusive Framework endorsed in 2017 will be followed up, namely two capacity building initiatives to equip policymakers on Inclusive Business Policy and Inclusive Business Eco-System Development. ASEAN Good Regulatory Practice (GRP) Core Principles, which is a practical, non-binding set of principles to serve as a guide to mainstream GRP into ASEAN work, was adopted. Assessment of ASEAN Readiness for the Fourth Industrial Revolution (Industry 4.0) was completed by the ASEAN Secretariat. Adoption of the M&E System of the ASEAN Community Statistical System (ACSS) Strategic Plan 2016-2025 by the ACSS Committee, in line with the AEC 2025 M&E Framework, as well as the approval of the key performance indicators (KPIs) for measuring the outcomes of four strategic components of the ACSS Strategic Plan 2016-2025. Capacity building activities and technical assistance extended to CLMV nations through the initiative for ASEAN Integration (IAI) Work Plan III and CLMV Action Plan 2017-2018 that are aimed at enhancing the capacity of these member states to meet regional commitments and promote inclusive development. Implementation of ASEAN’s FTAs with China, Japan, Korea, India, Australia and New Zealand was reviewed. Negotiations to enhance the Product Specific Rules under the ASEAN-China Free Trade Area (ACFTA) Upgrading Protocol’s future work programme was concluded. Recommendations of Stage Two of the General Review of the ASEAN-Australia-New Zealand Free Trade Area (AANZFTA) Agreement was endorsed. First Protocol to Amend the ASEAN-Japan Comprehensive Economic Partnership Agreement, which incorporates the Chapters on Trade in Services, Movement of Natural Persons and Investment was finalised. The signing of the ASEAN-Hong Kong, China Agreement and the ASEAN-Hong Kong, China Investment Agreement was completed.